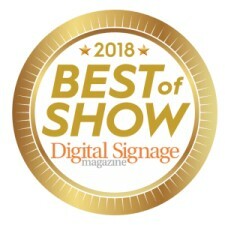 Sterling, VA, June 19, 2018	(Newswire.com) - Mvix, a leading provider of content-rich digital signage software and solutions, today announced that, for the second year running, they won the 2018 InfoComm Best of Show Award for Digital Signage. 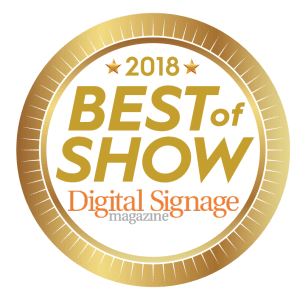 Presented by NewBay Media and Digital Signage Magazine, the Best of Show Awards recognize new and outstanding products exhibited at the InfoComm 2018 show. Mvix won the same award in 2017. The 2018 award was presented to Mvix for its content-rich, cloud-based digital signage software, XhibitSignage. The software enables users to remotely manage, update and display dynamic content on digital signs, video walls and interactive displays and kiosks - all in one platform. The software includes free monthly updates, whether using Mvix players or third-party players. In addition to the content widgets, XhibitSignage has management features such as multi-user access, playlist management, screen-layout editor, calendar-based scheduling and day-parting, and reporting. "We're honored to with the Best of Show Award for the second year running," said Mike Kilian, Senior Director of Business Development at Mvix. "It’s great to be recognized for the work and effort we've put into our software to give end-users more choice when it comes to building their digital signage networks, and to make content acquisition easy." Mvix is offering a 14-day free trial of their software for third-party digital signage players. To sign up, contact Mvix at partners@mvixusa.com or (703) 382-1739. Mvix is a leading provider of content-rich digital signage software and solutions. To date, their platform powers over 50,000 active screens for clients including Virginia Tech, NASA, Sodexo, Discovery Channel, Crowne Plaza, and the University of Washington. The use cases include employee communication, wayfinding, emergency messaging, and customer communications. Learn more about Mvix at www.mvixdigitalsignage.com, or call 703.382.1739.